For sure, most baby carriers are absolutely able to be used for nursing. There is a caveat I always share, though. Anyone who has ever been a new nursing mama will admit that those first few days, weeks, maybe even the first couple months of nursing were a learning process for both mama and baby. 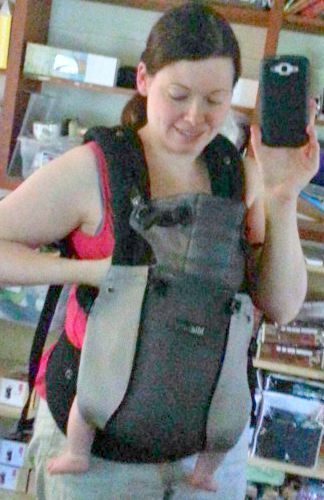 Likewise, any babywearer can try to remember back to her first times using a baby carrier with a floppy baby…and it was also a learning process! Both of these are skills that take time and patience to develop, so I ALWAYS recommend feeling confident in each skill separately before trying to combine them. In fact, nursing the newborn in a carrier can be extra tricky because they have no head control, which can complicate things in terms of your ease and comfort, as well as safety. When breastfeeding the newborn, as well as when wearing the newborn in a baby carrier, mamas should be completely aware of baby’s comfort and breathing. This can be especially difficult when trying to do both at the same time. However, if both skills are worked on separately, when it’s finally time to combine them, baby is usually a bit older, with more head control, and mama and baby are both usually a bit more comfortable with the ins and outs of their breastfeeding relationship. This is a great time to work on nursing in your carrier. Another important consideration in terms of ease of nursing in a carrier is the clothing you’re wearing. Nursing clothing, or clothing that allows you to access your breast without pulling up your shirt (so v-neck, scoop-necks, etc., where you can just access the breast from the top) will make life so much easier. Which carrier is best for breastfeeding? 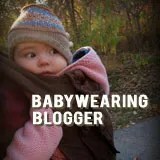 Which carrier is best for wearing and/or breastfeeding really is a matter of personal preference. There are so many factors like the physical build of the wearer, age/stage of baby, and just one’s own preference for a “feel” of a carrier. Most carriers can be used for nursing, with the exception being carriers that have a panel between mama and baby, which might make nursing difficult. Many of us who have nursed our children find that we “learned” to breastfeed with baby in a cradle position in our arms. Wraps and ring slings can support this semi-reclined position, if desired, though one has to be a bit more cautious in that cradle position, making sure that fabric behind baby’s head is not forcing baby into a chin-to-chest position (which can interfere with baby’s breathing, whether breastfeeding or not) or forcing baby into the breast , AND remember to ALWAYS, ALWAYS, ALWAYS monitor baby and return to an upright position when baby is done nursing. There has been so much development in the world of “baby” (specifically in Kangaroo Care and Breastfeeding) in the past few years, and we now know that most babies naturally orient themselves vertically, between the breasts…think biological nursing, laid back breastfeeding, the breast crawl, skin-to-skin kangaroo care, etc. So, MANY mamas (including myself) have found that we actually have more success breastfeeding baby in an upright position (added perk – it helps vary your nursing positions to work the less-used milk ducts in your breasts). This can be done in any carrier that allows upright, tummy-to-tummy positioning, and mei tais and buckle carriers can make it especially easy since you can just loosen up, lower baby down, and then re-tighten baby at breast level. When baby finishes, again, you need to return them to the higher, upright position. I LIVED in my Catbird Baby Pikkolo when my daughter was a baby, because I loved how easy it was with the dual-adjusting buckles to lower her down and then tighten her back up again, not to mention the fact that I could use it without the structured waist belt meant that there was nothing digging into me if I were nursing in the Pikkolo while sitting down. Again, it’s still important to monitor baby while nursing him/her, and this position is best when baby has good head control. If you have particularly large breasts, any carrier might be tricky to nurse in, and you might prefer a stretchy or woven wrap where you can pop baby out for nursing, but use the “x” of the fabric to help with discretion, if that’s important to you. 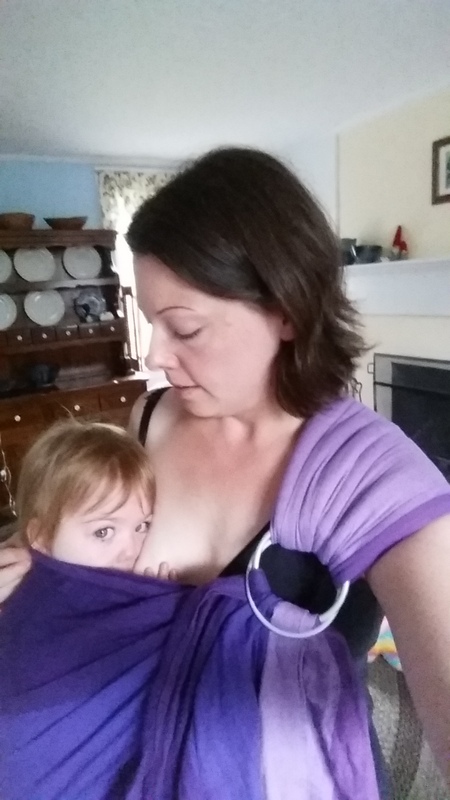 Ring slings are often recommended for nursing b/c the tail allows for “discreet breastfeeding.” Besides my own opinion that we need to make nursing in public more socially acceptable and you shouldn’t feel the “need” to cover up for others, some mamas prefer to be discreet for their own comfort. When baby is new and you’re both learning to breastfeed, it makes more sense to NOT try and cover up. You really need to see what you and baby’s mouth and airway are doing. If discretion is important to you, it’s probably better to practice at this point in a private place, rather than try to cover up. If you’re a more competent/confident nursing mama, nursing in a carrier can be discreet but you still should NOT attempt to cover baby’s face while he/she is nursing. Many babies actually hate being covered up, but it can also prohibit good airflow, make for a hot, uncomfortable experience for both mom and baby, or hinder breathing. 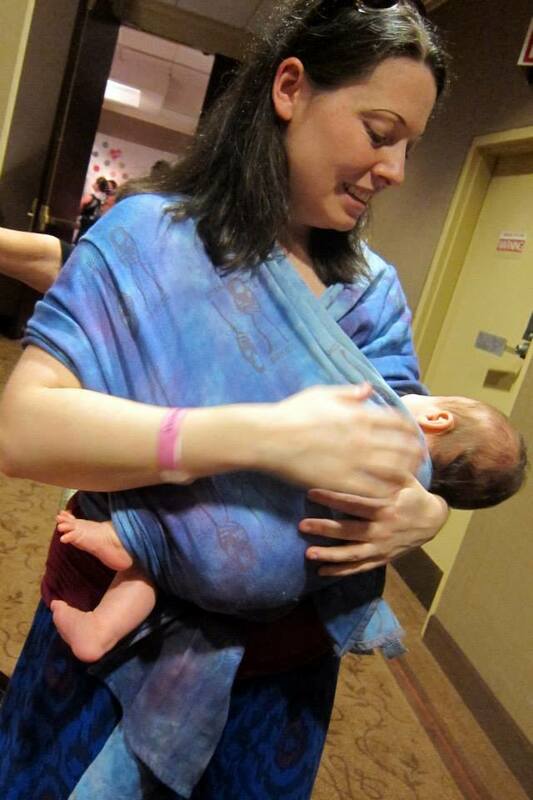 I hear ring sling tails often being described as “wonderful for covering up while breastfeeding.” For your own peace of mind and for baby’s safety, please do not cover baby’s face (while breastfeeding, or while wearing). Pull up the edges of the carrier to cover up a bit. You can use the tail of the ring sling or fabric from a wrap to cover over the top of the breast, but, again, not covering baby’s face. Carriers with head rests can allow you to have some privacy, but still be able to look down and monitor baby. Hoods used for discretion while nursing can be attached in a diagonal position, which will make you both a little cooler and allow for some airflow, as well as letting you see baby’s face and nursing position. I don’t know about you… but, I was never able to be “hands-free” when nursing my daughter in my carrier. I always needed one hand to support the breast while she nursed. I’ve actually heard this from a lot of mamas, so I know I’m not alone. Being hands-free while nursing was a promise of baby carriers that was really appealing to mamas a few years back, but most people who have experience nursing in carriers and most babywearing educators will tell you that very few people are actually able to be completely hands-free. It’s completely normal if you are not able to magically breastfeed baby in the carrier and have both of your hands free for something else. One hand free is usually quite helpful, even if the other hand is helping to support breast or baby. Also, again on a safety note, being “hands-free” or “one-hand-free” while nursing does not mean that you are free of monitoring baby while he/she nurses. It is always important to know how baby is doing and pay attention to his/her breathing and behavior when breastfeeding in the carrier. If you’re still nursing your toddler in your carrier, you might actually get lucky and finally achieve “hands-free” nursing if he/she helps out a little by supporting the breast on his/her own! Remember: Being able to breastfeed in your carrier is a fabulous perk of wearing your baby, and wearing your baby PROMOTES breastfeeding! I hope the information I’ve shared helps moms and their babes do this comfortably and safely. For more information and individualized help with breastfeeding and babywearing, try reaching out to your local babywearing educator, consultant, or babywearing group.